We are the product of our genes and the environment. Not only us, so are all living beings. It has never ceased to amaze me that all living things on earth have a single origin and share the same genetic code – what Francis Collins called ‘The Language of Life’. I would argue that deciphering this code has been humanity’s greatest scientific achievement till date. We are privileged to be alive at this point of the journey of our species when we can, not only read (sequence) our code but also edit it. If we consider the evolution of life on earth, the heroes of the journey have been the genes. All living organisms have just been vehicles for the genes and were strictly condemned to their genetic destiny. Typically the genes would lose interest in any organism after it crossed its reproductive stage and except for rare quirks, most organisms age quickly after reproduction and live barely enough to get their offspring to self sufficiency. Undoubtedly the environment also played a big part in shaping the genes, but looking at our planet’s history, the genes seemed to have wormed its way out of all natural catastrophes till now. Though the ‘homo centric’ approach is often derided by experts, we cannot deny the fact that our species, the homo sapiens have been the most ‘successful’ species considering where we have reached in the short 300,000 years of our existence. Numerous of our cousins like the Neanderthals and the Denisovans, perished while we survived, thanks to our genes. Bur did the genes make the final mistake in creating us? Though millions of species evolved over the last billion years and some of them survived for many millions of years none of them reached a stage where they could challenge the hegemony of the genes. And considering the life span of our species, our manipulation of the genes have been gradual. After discovering agriculture over 10,000 years ago, our ancestors realized that plants (and subsequently animals) could be bred to develop features (phenotypes) to our benefit. Though they could not specifically map out the direct genotype to phenotype correlations, they were smart enough to figure out how to get the desired output by trial and error. The benefits are clear in the way our population grew subsequently. But a lack of the clear understanding the science of inheritance did lead us to many blind alleys (like promoting the ‘Royals’ which still seem to carry a lot of interest to many, and ‘Eugenics’ which fortunately did not last long) and we had to wait for a convergence of many revolutionary technologies to finally enable us to break the genetic code. Once the code was broken it was only a matter of time to make the process cheap and quick, and develop other technologies like CRISPR to start making changes to the genes. The biggest strength of our species is our brains and the genes would have never dreamt of the additional uses we put it to. Developing such a smart organ would never have been the goal of the genes, and it must have been an ‘accident’ that a tool that was meant to enable us to survive and reproduce, later empowered us to search for salvation and now pushes us to aim for ‘Singularity’. Ray Kurzweil popularized this thought with his 2005 book ‘The Singularity is Near’ and was even bold enough to suggest 2045 as the year when we would achieve that point (when humans transcend their biology – i.e. the end of natural death). Though I loved the book, I was rather skeptical of the timeline that he had put for reaching Singularity. Subsequently I did attend the Executive education program at the Singularity University, and though I found the program very useful, it failed to convince me of the proposed timeline. I was however convinced that genomics would be the most significant instrument to change the future of our species and its application in medical health, life sciences, agriculture, veterinary sciences, aquaculture, environmental clean up and so on, seemed limitless. That belief started me on a journey in Genomics based entrepreneurship which has allowed me to actively participate in this revolution. Understanding the genetic code is now enabling us to figure out the cause of diseases and the best way to cure them,. We are able to understand why some people respond to certain drugs why others don’t, and why a few even have very adverse effects. The whole paradigm of drug discovery is changing from a one size fit all, to targeted therapies and personalized medicines. Still it has been only a few years since we have been able to sequence and analyze the genes in a cost effective manner. The knowledge we have gained is fascinating, but we still have a long way to go, as the genes function in many combinations and through different pathways which makes the research very complex. We still do not even know the function of more than 50% of our genes and what the millions of variations of the nearly 20,000 genes in our genome mean, is yet to be studied. In that context, contemplating the editing of the genes on human embryos seems hubristic at the least and terrifying at the worst. Breaking the genetic handcuffs is very important for our species but the focus should be to first understand the science fully and restrict our initial editing efforts to non human organisms. There may be a few who are in a hurry to get to immortality, but let us make sure that the genes don’t have the last laugh. MedGenome, the leading genomics research and diagnostics company, announced completion of $30 million in Series C financing led by Sequoia India and Sofina s.a., with participation by Zodius Capital; Kris Gopalakrishnan, co-founder and former CEO of Infosys; and Lakshmi Narayanan, former CEO of Cognizant. MedGenome operates the largest Next Generation Sequencing (NGS) lab in South East Asia, and a CLIA-certified, CAP-accredited sequencing lab in Foster City, CA. The company’s services are being leveraged by pharmaceutical and biotech companies across the globe. MedGenome’s diagnostics tests include many “firsts” for genetic diagnostics in India, including first liquid biopsy “OncoTrack” for monitoring cancer treatment, non-invasive prenatal screening test (NIPT) for pregnant women, carrier screening test for couples planning on a baby, and whole exome sequencing test for identifying mutations in rare diseases. “Precision medicine is the ultimate goal of clinicians and patients alike which can be enabled through extensive biomarker discovery,” said Sam Santhosh, Founder and Chairman of MedGenome. 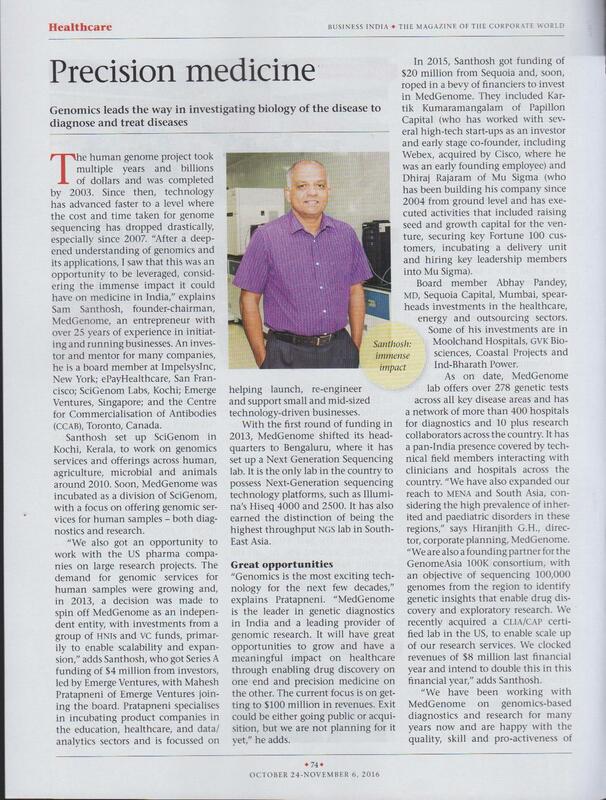 “MedGenome has established leadership in genetic diagnostics for inherited diseases in India. We will now expand DNA based testing to cover infectious diseases like tuberculosis” he added. 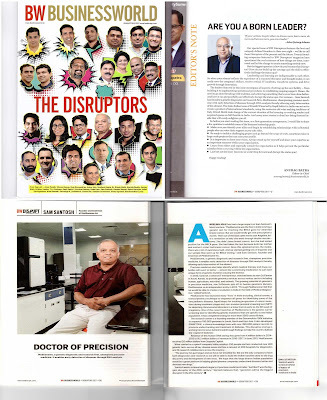 “MedGenome continues to emerge as a leading genomics company bringing affordable and high quality genetic testing to emerging market consumers, supporting physicians make better decisions and leveraging the power of that data to potentially impact global drug discovery market,” said Abhay Pandey, Managing Director at Sequoia Capital India Advisors. “Sequoia is excited to continue this partnership and are committed to helping MedGenome strengthen its proposition to consumers and doctors in these markets and become a significant player globally in the arena of precision medicine through data from the currently underrepresented emerging markets including India”. "I am investing in MedGenome which addresses the extraordinary opportunities that exist today in the development of precision medicine” said Kris Gopalakrishnan, Co-founder and former CEO Infosys. “MedGenome’s platform and network are designed to generate actionable insights for clinicians to diagnose and provide better management for complex diseases at reasonable costs." “Sofina is looking forward to this partnership to broaden the use of genomics-based diagnostics in the Indian healthcare sector, and tap into the value of Indian genetic data for research. We believe MedGenome's efforts will have a definitive impact on healthcare delivery in India and around the world,” said Xiao-Tian Loi, Investment Manager at Sofina. 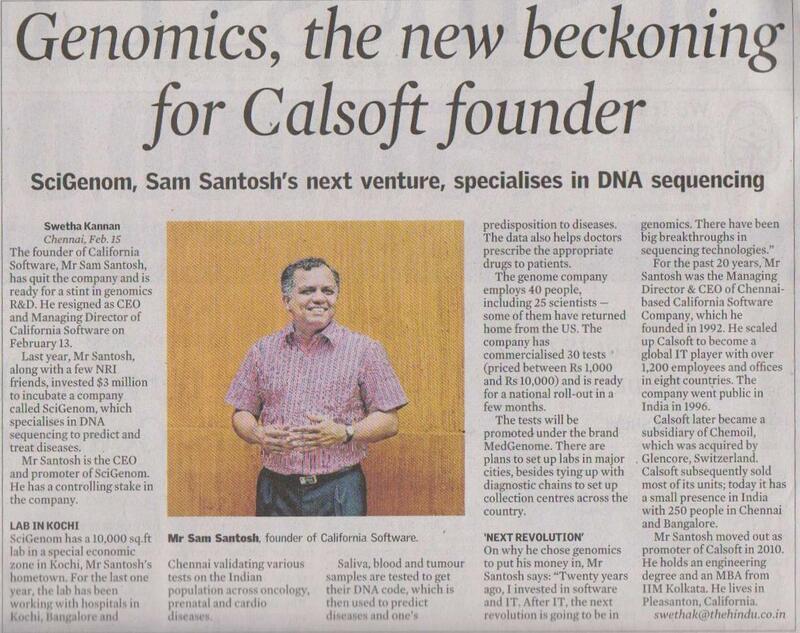 Sam Santhosh is the Founder & Chairman of MedGenome Inc, a Genetic Diagnostic and Research company with labs in San Francisco, USA and Bangalore, India. Sam is also the Promoter & CEO of SciGenom Inc. - a genomics R & D organization that conducts research work aimed at understanding the role of DNA sequence variation in all living things..
"If you don't read, you can't lead"